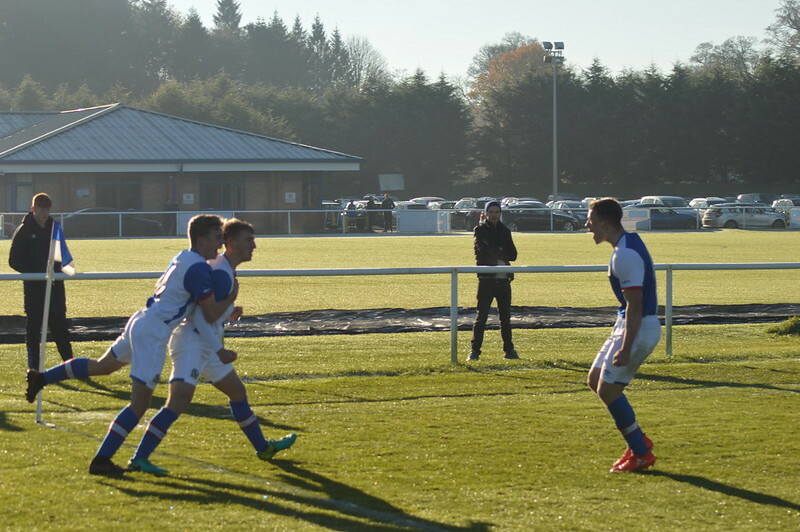 By Owen Keighley: Blackburn U18s earned a creditable 2-2 draw with Liverpool U18s on Saturday morning despite playing the majority of the game with ten-men. On a bitterly cold morning at Brockhall Village, Liverpool almost took the lead after 3 minutes when a counter-attack move saw Rhian Brewster put in a superb cross for in-form Glen McAuley, but the Ireland International was fired his shot over the bar. After 14 minutes, Rovers took the lead. Brad Lynch rattled the Liverpool crossbar and when the visitors struggled to clear the ball, Dan Butterworth turned his marker inside the box and the striker calmly fired past George Shamal. Ten minutes later Liverpool were awarded a penalty when Tyler Magloire was judged to have tripped McAuley inside the penalty area. McAuley stepped up and confidently dispatched the spot-kick, though Rovers felt a little hard done to with Referee Barry Lamb initially awarding a goal-kick, before his assistant intervened. On 29 minutes, Rovers captain Callum Hendry was shown a straight red card by Lamb after a high challenge on Abdi Sharrif. Liverpool almost made the man advantage count six minutes from the interval, only to be denied by Ben Ascroft, who pulled off two fabulous saves to deny Camacho and McAuley from close range. The away side did take the lead after an hour though. A near post cross by Sharrif was swept in magnificently by McAuley on the volley, leaving Ascroft with no chance. This galvanised Rovers, who were unfortunate not to equalise in the 73rd minute when Joel Steer sent Dan Butterworth through on goal, but his effort was tipped around the post by George. Rovers got their equaliser in injury time when a Andrew Jackson free-kick from the right evaded everyone in the box and found its way into the bottom corner, sparking wild celebrations among the Rovers players. It could have been even better for Blackburn who then passed-up a glorious chance to take all three points in the closing seconds. Tre Pemberton beat his marker and found Steer with a cross but the forward flashed his shot narrowly wide. “I thought the reaction was outstanding when we went down to 10-men and we could’ve won it at the end.” Jones said. “Liverpool played well, they were content to keep the ball and scored with a great finish from a cross.